The Nature Park Rila Monastery was established during May of the year 2000. Its territory is composed of 27,370.7 hectares of forest, meadow and alpine peaks. 13,000 hectares are alpine meadow. The park was established in order to protect the ecologically valuable plant and animal communities existing here, as well as to preserve the remarkable diversity and beauty of the landscape. Each of these natural resources is developed for tourism. Owing to the intense effects of high alpine weathering and the Rila massifs considerable gravitational force, here one may find typical alpine features such as scree and talus slopes. Especially impressive from a geomorphologic point of view is the area around the Kipilova Meadow, including a fascinating stone rainbow and several high alpine peaks – The Evil Tooth (Zleeya Zub), Iglata, Koopenite, Lovneetsa, Orlovets, and Eleni Vruhk. The entire slope rising from the Rila River is deeply serrated with many gullies and couloirs, through which rage flashfloods, avalanches and rock slides. The more famous of these gullies are Beliya Oolook, Dulgiya Oolook, and Varnika, known collectively as The Evil Streams. Due to the action of glaciers during the Quaternary geologic period, there now is a considerable number of glacial lakes at the higher elevations of this region. Within the park’s boundaries there are 28 such lakes. The highest of these is the first of the so called Devil’s Lakes, at an elevation of 2,445 meters, and the lowest of these is the Dry Lake, elevation 1,892 meters. Additionally, the largest alpine lake on the Balkan Peninsula is found in the park – The Smradleevo Lake, with a surface area of 212 decares and a maximum depth of 24 meters. The Nature Park Rila Monastery is surrounded by 36 alpine peaks reaching 2,000 meters or better. The highest of these are: Golyam Koopen (2,731 meters); Cherna Polyana (2,716 meters); Rilets (2,713 meters); and Popova Kapa (2,704 meters). Several rivers and streams flow throughout the territory of the park. Among them are the following: The Rila, The Illeena and The Drooshluovitsa. 1,400 species of higher plant occur within the park’s boundaries, 71 of which are included in Bulgaria’s Red Book of Rare, Threatened and Endangered Species. Of these 71 species, 19 are endemics, and 5 of these are local endemics which occur only within the park. The following species occur within the park and are included in the European List of Rare, Threatened and Endemic plant species under different conservation statuses: Rilski Reven (…), Bodjectvena Igleeka (…. ), Ynkieven Lopen (…), Planinsko Podroomiche (…), and Rilsko Podroomiche. The particular aspect (direction of exposure) of The Rila Valley allows for unique combinations and distributions of woody species. The following occur within the park: oak, beech, fir, spruce, yew, white fir, black pine, lime, sycamore, ashe, birch, dwarf pine and juniper. Over 150 species of vertebrate animal species occur within the park’s boundaries, 14 of which are included in Bulgaria’s Red Book. Observant and patient visitors may catch sight of the following species: Alpine Newt, Tree Frog, Mouse Snake, Marten, and The Imperial Eagle. 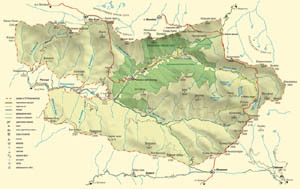 During 1986 The Rila Monastery Forest was established on 3,676.5 hectares of forested land around The Rila Monastery. This monastery was declared a World Cultural Heritage Site by UNESCO during 1983.